Gryphon and Pleiades, the Senior Leadership and Service Honor Society has a long history at Clark University. The organization today is the result of a merger of two earlier honor societies, Gryphon, the men’s honor society founded in 1909, and Pleaides, the women’s honor society founded in 1948. The Society’s mission is to provide a forum for thoughtful dialogue between the University and its undergraduate students. To that end, the members of Gryphon and Pleaides shall invite conversations with University officials on subjects of strategic concern and shall make every effort to bring their collective experience to bear on the problems brought before them. Members of Gryphon and Pleaides will also engage in service projects focused either on the Clark community or on the immediate Main South neighborhood. 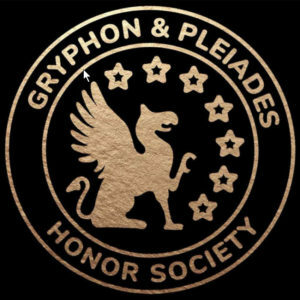 Each spring members of Gryphon and Pleiades will induct 12 rising seniors into the honor society. Those members will be selected on the basis of an outstanding record of academic achievement, service and dedication to the University. There will be a clear expectation that they will be active and production contributors to the dialogue Gryphon and Pleiades seeks to facilitate and to the service in which it will engage. Dr. Kevin McKenna, Senior Associate Dean of the College, serves as adviser to Gryphon and Pleiades.